Yesterday, November 14 2018, was the private opening of the exhibition and retrospective Youssef Chahine at The Cinemathèque Française. Egyptian actors Lebleba, Nabila Ebeid, Mahmoud Hemeida, Yosra EL Lozy, Ahmed Yahia made the trip especially from Cairo to attend this important event in tribute to their master Youssef Chahine. Also present were Marianne and Gaby Khoury from Misr films International, the president the Cinematheque Costa Gavras and its general director Frédéric Bonnaud. Then the Egyptian ambassador arrived and met with the officials of the Cinématheque and greeted the actors and discussed with them and the president and General director of the Cinematheque Later, Christian Louboutin the world famous shoemaker of the stars, and sponsor of the event, also attended and met for the first time with the Egyptian stars. A tour of the exhibition was presented by it curator Régis Robert and the scientific curator Amal Guermazi. 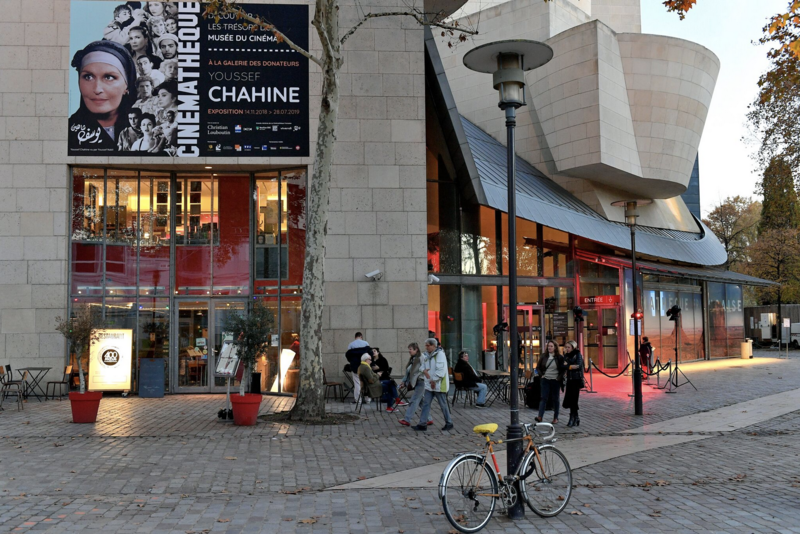 The exhibition gallery was packed with guests from cinema specialists, to directors, and officials from French institutions who support cinema in France. They all listened fascinated by the explanation of the curators, watching the numerous clips from Chahine’s movies screened on the walls and discovering the world of Chahine. A cocktail ended the visit before the start of the screening in the great theatre of the Cinematheque, where Frederic Bonnaud made a speech about Chahine’s career and explaining how this exhibition was organised and made possible,presenting the Egyptians actors, thanking all the sponsors, then he asked Christian Louboutin to come up on stage to say a few words about his love of cinema and especially Egyptian cinema. Finally Marianne Khoury was invited on stage and said how happy she was, mentioning that the actors have traveled for the event at their own cost and thanked them. She also thanked the Cinematheque for the wonderful event and said that Youssef Chahine would have been very pleased to see such a fully packed theatre for his movie. Finally there was a surprise to end the presentation, Amal Guermazi, the scientific curator, went on stage and played on her violin the melody of Happy birthday and all the audience sang along to celebrate the birthday of Lebleba who stood up, very moved by this attention, to greet the audience.